Yipee! I have another successful soup recipe under my belt! I’m not a huge soup person – it’s never something I get cravings for. But I’m starting to think that maybe I just really like smooth, blended soups. 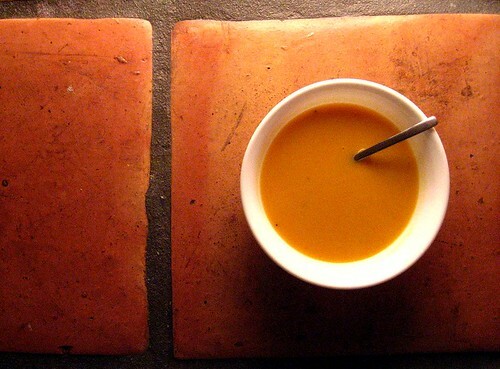 I loved my Chioggia Beet Borscht, and now I love this Butternut Squash Bisque. I had two butternut squash sitting on my counter for the last few weeks. I initially wanted to bake something with them (I was considering an old-fashioned butternut squash pie – like a pumpkin pie, but not), but then I decided that I should probably eat healthier 🙂 Kirk and I have been eating a lot of greens the last few days, and when I got home from work tonight I just didn’t like the idea of having yet more greens for dinner. 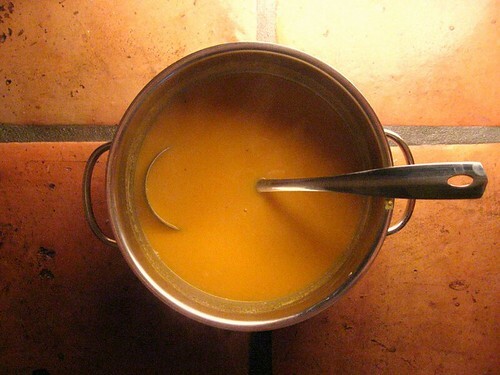 I looked over at the counter, saw the squash, and decided on soup. In other news, I have some other projects (in addition to cooking) that I am starting to get into. Once I’ve done a little more with them, I’ll definitely share more info. I will tell you this, though: it involves using my shiny new jigsaw! Slice the tops off the squash. Halve them lengthwise, ad scoop out and discard the seeds. Peel the squash with a vegetable peeler. Cut the peeled squash into 1-inch pieces. 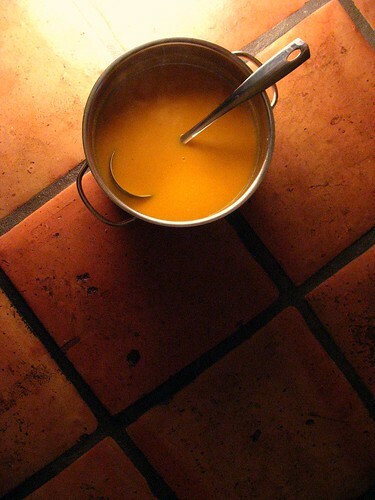 Place the squash, broth, salt, and 1 Tbsp butter in a soup-pot. 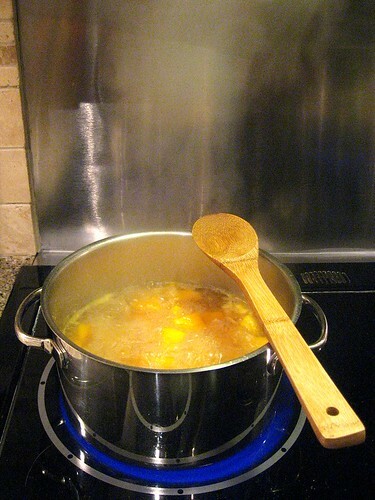 Bring to a simmer over medium-high heat and cook until squash is fork tender, about 15 minutes. about 5 minutes before the squash is done, toss in the ginger and garlic. Transfer the puree back to your pot. Add the remaining two Tbsp butter and cook over medium heat for about 5 minutes, stirring to combine the butter. Slowly whisk in the cream and nutmeg and heat through. Add pepper to taste, and garnish with chives (if you want to…).